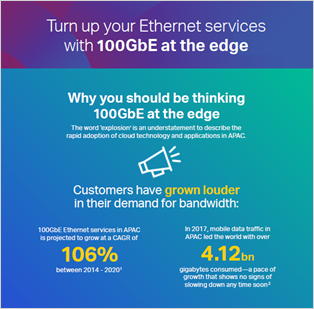 With the voracious appetite of consumers in Asia for high-bandwidth content, 100GbE at the edge is coming to APAC sooner than you think. Should you be concerned? Download this infographic to learn why preparing your network to turn up bandwidth capacity to the edge is essential for sustainable business growth. DCI , 5G , SDN ,IOT, FTTH are the biggest explosion thats happening to the bandwidth .the internet penetration rate of the users have been increasing tremendously. to make sure we acquire the rapid advancement in the technology, rapid new technology supporting this has to be deployed.